As emergency medicine resources go, this is a comprehensive collection of useful notes related to a range of specialties. The WikEM resource is only likely to become more useful over time as more and more users contribute. 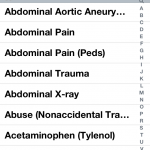 Residents and medical students will find this app particularly useful for its broad range of content and concise high-yield facts.